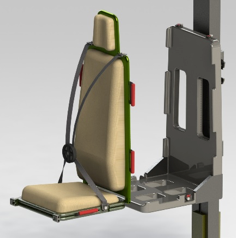 The purpose of this multi-phase program is to advance technology and develop an innovative design of a seat for military ground vehicles that not only protects the occupant in a blast event but, as importantly, provides a safe and efficient means for evacuating the occupant after an event without causing further injury or aggravating existing injuries. Both features of the seat, the blast protection and the extraction capability, must perform equivalently across the weight range from the 5th percentile unencumbered female to the 95th percentile fully encumbered male. The blast protection must absorb the blast energy and mitigate injury equivalently across the spectrum of blast pulse peak acceleration values and durations, without any adjustment or input by the occupant. The extraction procedure provided for in the design must maintain the stability, health and safety of the patient, while the extraction capability must be maintained in all conditions of damage or deformation to the vehicle structure, to the seat structure and to the seat-to-vehicle mounting system. The blast protection must, as a requirement, adapt to occupant weight and blast pulse shape without input power of any kind since a mine blast will have a high likelihood of disabling any power system, rendering a powered energy absorber non-functional. Wolf’s extractable seat system approach comprises a structurally strong seat system equipped with an energy absorber and a removable protective POD (Portable Occupant Delivery system). The removable POD detaches from the seat structural components after an event and functions as a litter for stabilizing and transporting the injured occupant. The POD is lightweight, comprising only the structural strength needed to support the occupant, maintain shape and provide handholds. Its strength to withstand the blast is derived from the heavier structural components of the seat, which are left behind in the vehicle during extraction. The restraint system also derives its strength from the heavier seat structure, but then remains attached to the POD for patient stability during extraction and transport. During normal transport in the vehicle, the POD attaches to the seat structure and overlays the seat pan and seat back of the seat.